The song that the two were singing standing on the steps of the Unnayan Bhawan today had all the ingredients of a romantic number but few among the onlookers knew that behind the ditty lay a rare gesture of humanity. A few years ago, on any ordinary day in Jorhat in eastern Assam, one could see and hear a blind boy beating a rhythm on his pair of drums (negera) on the sidewalk in front of the Bisturam Barooah hall and begging for alms. To thousands of daily commuters on the busy AT Road and who were among the crowd being entertained today, the blind drummer boy was an institution as famous as the historic tulip structured building behind him. Today, a young man, Pankaj Dutta, the blind beggar sans his drums was belting out a romantic number in Assamese standing in front of the Unnayan Bhawan which houses the Jorhat Municipal Board, Zila Parishad office and about 50 shops. One would assume that Pankaj had upgraded himself and moved base to where the grass was perceived to be greener. A closer look and one could see another youth grinning and crooning along with him, his voice as mellifluous. 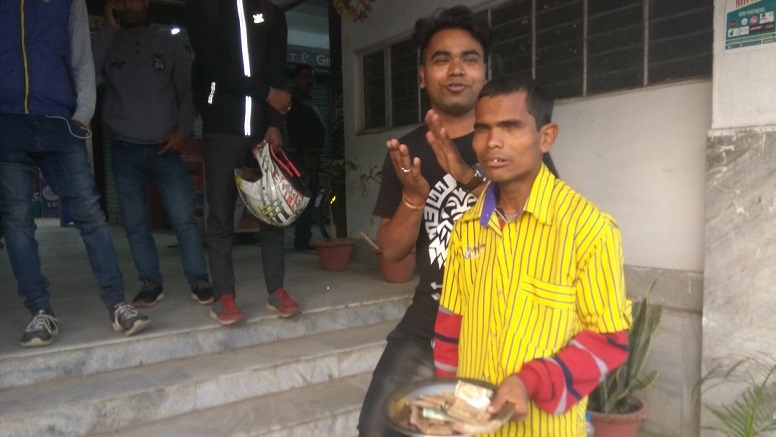 In a rare gesture of humanity, the youth Prandeep Hazarika of Dohotia had brought Pankaj to the place so that he could be heard better and draw the attention of the kind hearted into giving alms. Prandeep, who was the best singer in Dibrugarh University in 2015 and 2016 said that Pankaj could hardly be heard above the cacophany at the Baruah Chariali intersection where he had shifted in recent times. Pankaj is a tale of exploitation, brought about eight kms from Panisokuwa by auto and put to beg by his father in front of the Bisturam Barooah hall. He was taken out of the Jorhat Blind School to do this. After the death of his father, Pankaj did not venture that far so that he could avail of the autos without guidance. In the meantime, the talented drummer had learnt how to sing with the help of a cellphone which had been loaded with songs. “Pankaj is a stage singer and sings with us on during performances,” Prandeep said. Pankaj had earlier denied that he had received the Rs 1000 aid given by the State government through the Social Welfare, most likely to elicit sympathy, department but his name had been on the list. Whatever the reason, with a voice like his and drumming skills, Pankaj now had the means to earn his bread through song and music, especially when he had a friend like Prandeep who was bent on drawing him out. Prandeep in all humility claimed that he was learning how to sing from Pankaj but the two time best singer of Dibrugarh University was the one to teach Pankaj the romantic song to which he had given the tune.